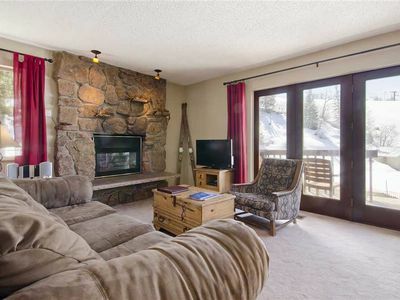 Ski to your back porch at the Right-O-Way Chalet. 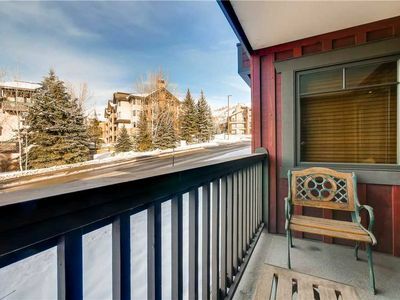 This cozy four bedroom townhome has space for a couple of families or more and a Slopeside location that is hard to beat. 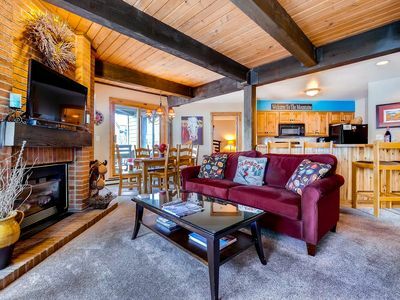 Located right on the Right-O-Way beginner ski trail, this warm and inviting Chalet provides easy access on and off the mountain. 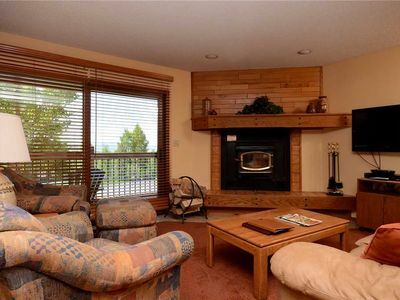 When you aren’t playing on the mountain and you can enjoy looking out from the expansive decks on every level with views right up the mountain and on to the trails. 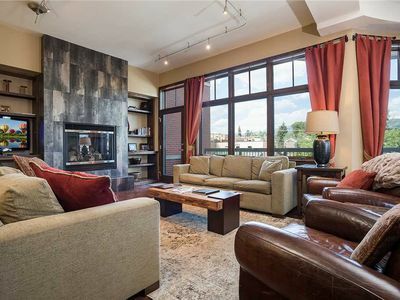 The central focus in the open plan living area is the wood-burning fireplace. 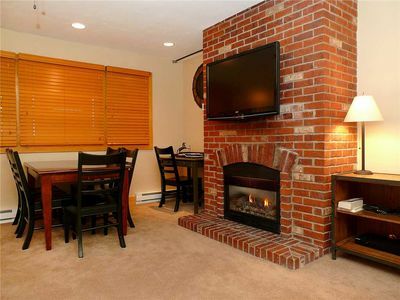 Comfortable seating surrounds the fireplace and a large flat screen TV makes it the perfect place to relax or talk about the adventures of the day. 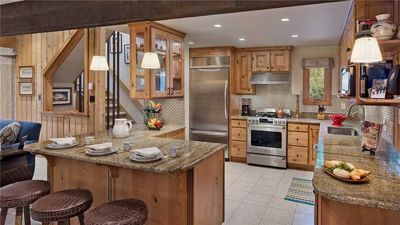 The kitchen is located just off the living area and has been fully remodeled with high end stainless steel appliances, including a gas stove, and granite countertops. The aspiring chef will find it fully stocked with everything needed to prepare a feast for the entire family. 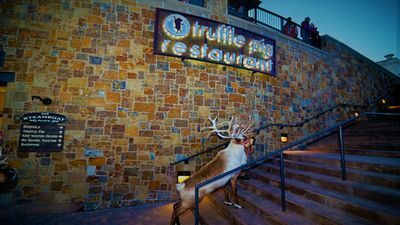 For early morning meals, or apres ski while the chef prepares, you can sit at the breakfast bar with seating for 4. 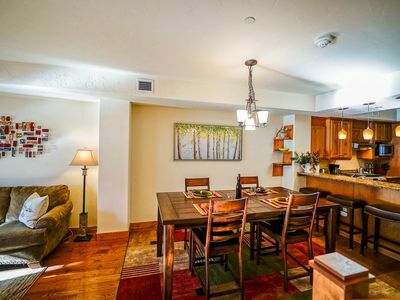 Next to the kitchen is the dining table with seating for 8. 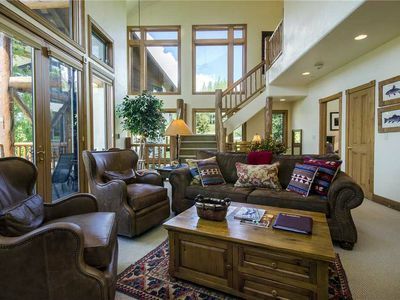 From the dining area you can enjoy views of the fire or out to the porch and mountain beyond. There is plenty of sleeping space for up to 13 guests. 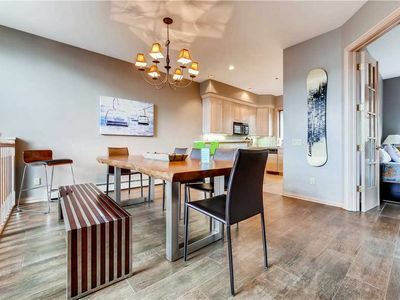 Upstairs you will find the master bedroom with a King Bed and ensuite bathroom and a second bedroom with the option of a king bed or two twin beds that uses the bathroom just outside the room. Both bedrooms have access to the deck from inside. Downstairs there is a room with three twin bunk beds, making room for six guests. Next door there is a bedroom with two twin beds. 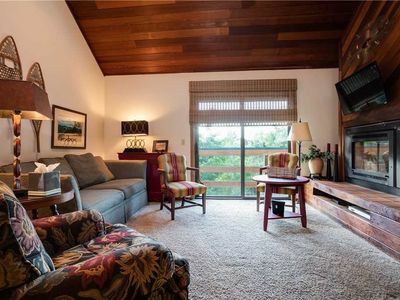 These two bedrooms share a bathroom and have access to the lower deck from the bedrooms. 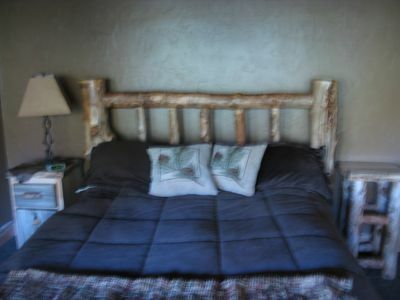 There are two twin trundle beds for additional sleeping options. 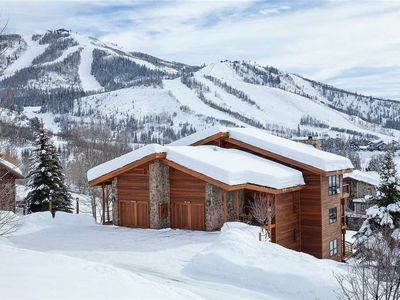 When you are ready to explore Steamboat you can have the shuttle take you the mountain village, downtown or to the grocery store if needed during the winter. Throughout the year, you can use the community pool, hot tubs and gym. 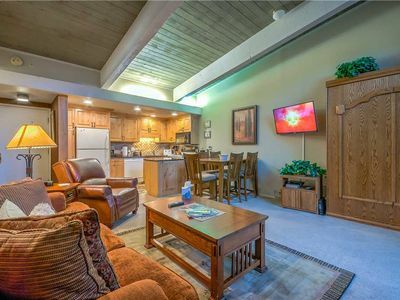 The chalet comes with everything you will need, including, washer/dryer, plush bath towels and robes, wireless internet and cable TV. 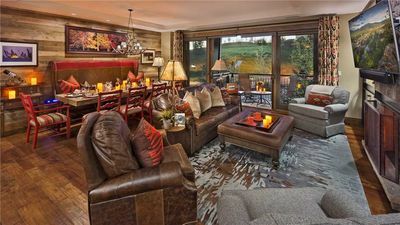 SE038 by Mountain Resorts ~ Private Deck with Great Views, Hot Tub! 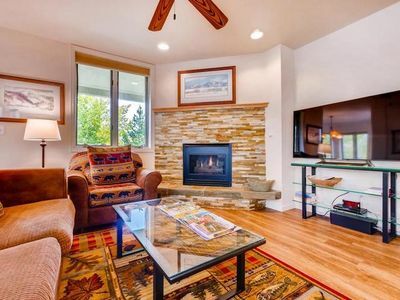 SK302 by Mountain Resorts ~ Nicely Remodeled Kitchen, Hot Tub Onsite! X2750 by Mountain Resorts: Easy walk to Mtn Village! 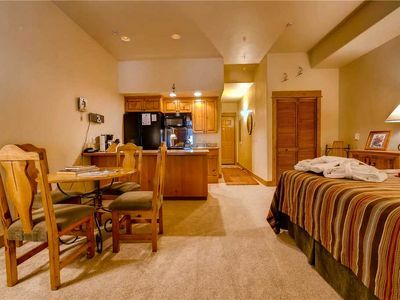 Cozy Studio, Wi-Fi, W/D, Fitness Center, Pool & Hot Tubs! 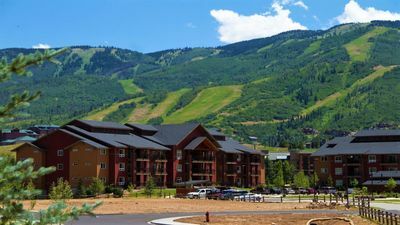 Fantastic Summer Rates - Perfect Steamboat Condo With Hot Tub & Pool! 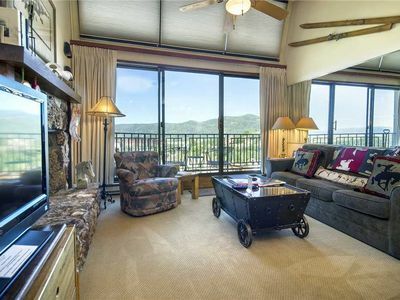 Enjoy your cozy suite at Steamboat Springs! 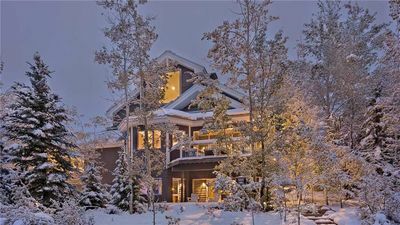 2 Bedroom Mtn Condo w/Private Sauna & Winter Shuttles!